Luton Town cantered into the third round of the FA Cup after a dominant second half showing saw them dismantle National League opponents Gateshead this afternoon. It hadn't looked like such a scoreline was going to be on the cards during a first half in which although Luton's extra quality was apparent, they only led by an Olly Lee goal just before the interval. However, Nathan Jones's side then ran riot in the second period, with Dan Potts and Elliot Lee making it 3-0, before Danny Hylton and Luke Berry added real gloss to the margin of victory in stoppage time. 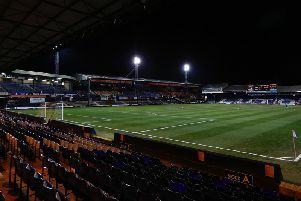 The magnitude of the defeat was harsh on Heed who had threatened at times, denied by the woodwork twice, but Luton's class simply shone through on the day. Prior to kick off, Town made one change, Andrew Shinnie replaced Harry Cornick, with Town reverting to their diamond formation they ended the 2-0 win at Crewe at last weekend, while the visitors included former Luton midfielder JJ O'Donnell in their line-up. On a ground where they had only won once and scored once, that an own goal, in their history, Town dominated possession and territory in the early stages, but took a good 13 minutes to fashion a chance, Alan Sheehan's cross met at the back post by Potts, forcing a decent save from Dan Hanford. The following set-piece was also met by Potts, who nodded back for Glen Rea to glance straight at Hanford, while Berry should have done better from 12 yards out, volleying over the top after losing his marker, Shinnie's shot also charged down. Heed's first real opportunity saw leading scorer Danny Johnson bulldoze his way through a tame challenge, Marek Stech out quickly to grab the ball off his toes. With very little goalmouth action in the opening half hour, Johnson fired an ambitious swivel volley over the top, the forward also missing with a low drive from 20 yards. The Tynesiders continued to threaten sporadically, Luke Hannant's cross headed at Stech by Jordan Burrow, the keeper hanging on comfortably. Town then had the lead five minutes before half time when a mix up at the back saw defender Scott Barrow collide with his own keeper, the ball slipping out of his grasp, with the Heed man out cold. Olly Lee took advantage, slotting into the net, while the game was stopped for a good 15 minutes of treatment to Barrow, who was taken to hospital by ambulance. Town might have moved further in front moments after the interval, Berry scooping over after a clearance fell into his path, with Shinnie's low 30-yarder easy for Hanford. Lively Heed sub Jordan Preston looked the most likely source of a way back for the hosts, testing Stech with a low shot from range. Luton looked to have put the game beyond doubt on 63 minutes though when Shinnie cleverly beat Jamal Fyfield and dinked over a cross from the right where Dan Potts sent a towering header past Hanford for his sixth of the season and four in five games. If that looked like game over, it definitely was just that five minutes later, Olly Lee's shot rebounding into the path of brother Elliot, who clinically made no mistake from close range. It was the duo's last action of the afternoon, replaced by Jordan Cook and Luke Gambin, while Stech held Preston's angled effort as Gateshead tried for the most unlikely of comebacks. With 12 minutes to go, Heed were denied twice by the woodwork in the space of 30 seconds, Johnson smashing against the bar, with Paddy McLaughlin's effort also striking the base of the post. Hatters then counter attacked at pace, Hylton going over the box, earning himself a booking for diving from official Ben Toner. However, the striker had the last laugh in stoppage time as Cook escaped on the left and his ball across the face was tucked home at the back post by Town's leading marksman for his 13th of the season. Richard Peniket shanked wide, before the icing was well and truly put on the cake, Pelly-Ruddock Mpanzu picking out the run of Berry who took a touch before slamming into the net, making it a mightily impressive 17 goals in just four games for Nathan Jones' side, who will now hope to be paired with one of the Premier League big boys in tomorrow night's third round draw. Heed: Dan Hanford, Robbie Tinkler, Fraser Kerr, Neill Byrne (C), Scott Barrow (Jamal Fyfield 46), Luke Maxwell (Jordan Preston 55), Paddy McLaughlin, Danny Johnson, Luke Hannant, JJ O'Donnell (Richard Peniket 55), Jordan Burrow. Subs not used: James Montgomery, Theo Vassell, Wes York, Callum Williams. Hatters: Marek Stech, Jack Stacey, Dan Potts, Johnny Mullins, Alan Sheehan (C), Glen Rea (Pelly-Ruddock Mpanzu 74), Olly Lee (Luke Gambin 68), Luke Berry, Andrew Shinnie, Elliot Lee (Jordan Cook 68), Danny Hylton. Subs not used: James Shea, James Justin, Jack Senior, Lawson D'Ath. Booked: Fyfield 53, Rea 59, Hylton 78. Hatters MOM: Luke Berry. Dominated proceedings in the middle of the park.